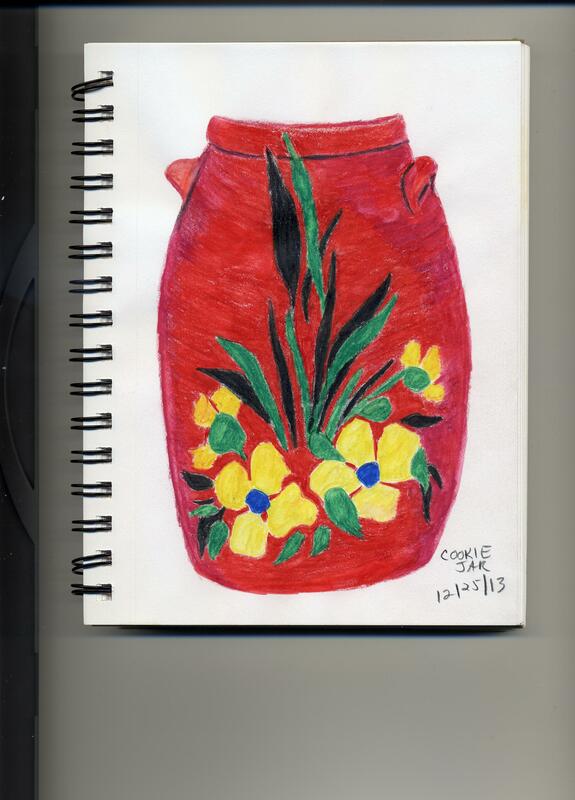 The sketch-a-day challenge continues. Of course, there were a few other things going on this past week, too. More baking, more shopping, more wrapping, followed by unwrapping, feasting, resting, and a Doctor Who Christmas special. Then there was more shopping, because I love the after-Christmas sales. I did manage to do a drawing every day. Some of them are very small and some of them are very lame, but I kept going anyway, because that was the challenge. 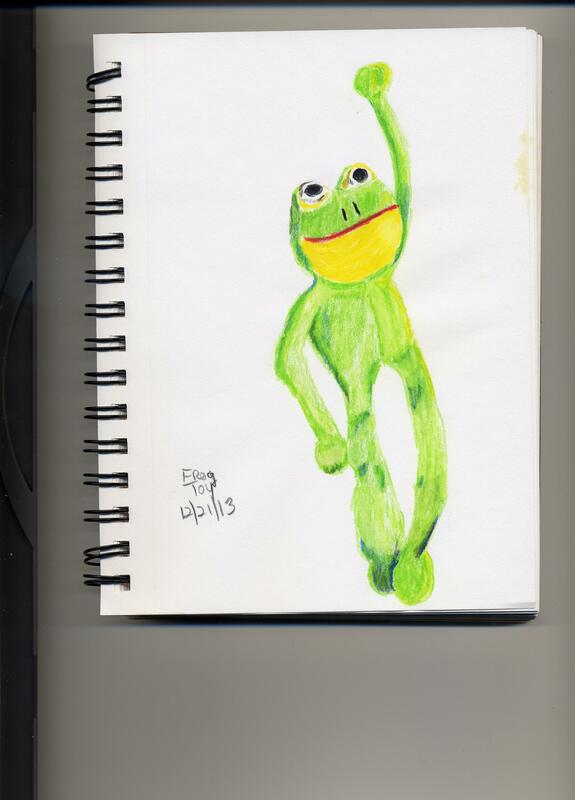 I started last Saturday with a drawing of a frog toy. It may appear to be waving, but it actually has magnets in its hands and feet and it’s attached to something metal. 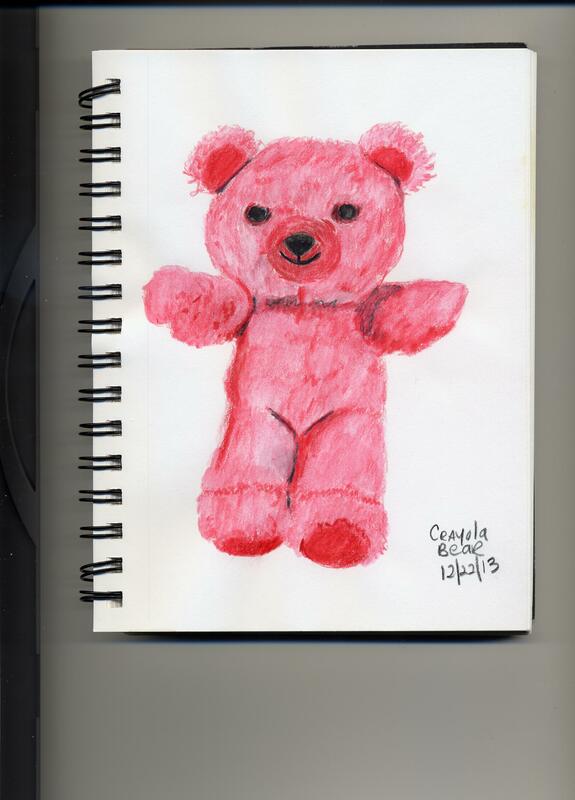 The next day, I drew another toy, a small Crayola bear that lives with my Christmas things. It looks a bit cranky; maybe it doesn’t like being put away with the Christmas things every year. 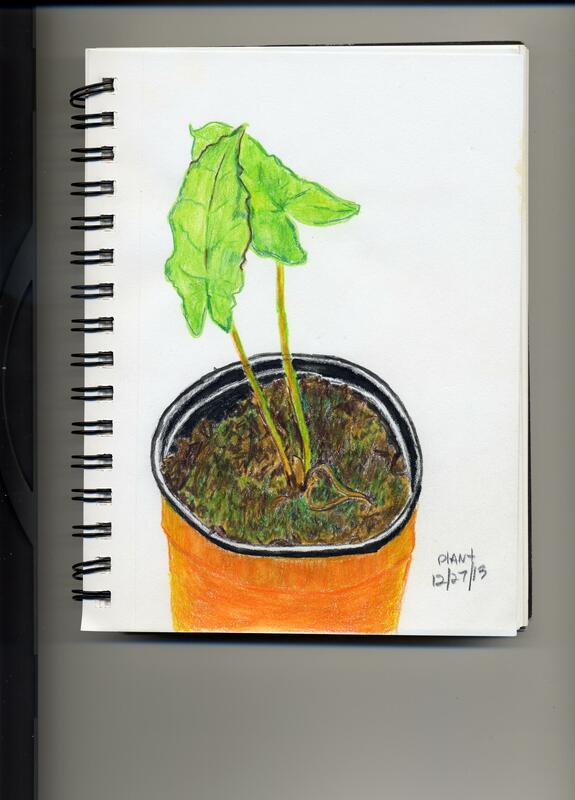 This next one is a small leaf. My brother-in-law dropped by on Christmas Eve Eve and my husband picked the leaf off his truck. 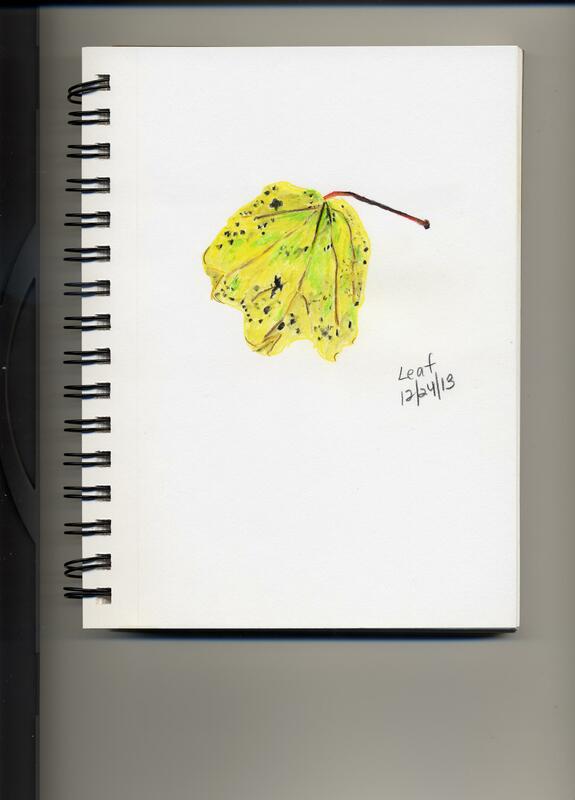 We exchanged cookies with my brother-in-law and my husband gave me the leaf to draw. It’s sweet of him to look out for me that way. As you can imagine, Christmas Eve was rather busy. 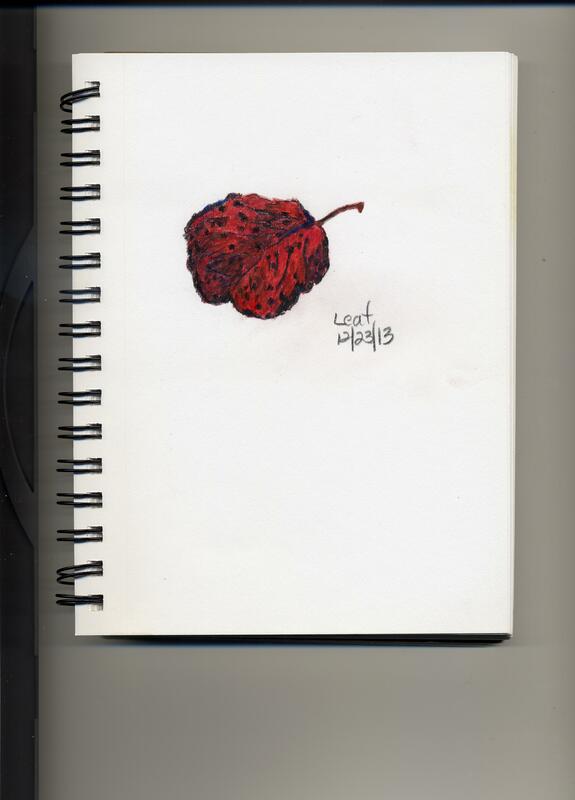 I drew another leaf. This one came from the maple tree in my front yard. It’s a bit spotty. On Christmas Day, I was even busier and I spent a lot of time in my kitchen, where my eyes fell upon the cookie jar I inherited from my mother. The proportions are a bit off, but I think my sisters will recognize it when (if?) they read my blog. 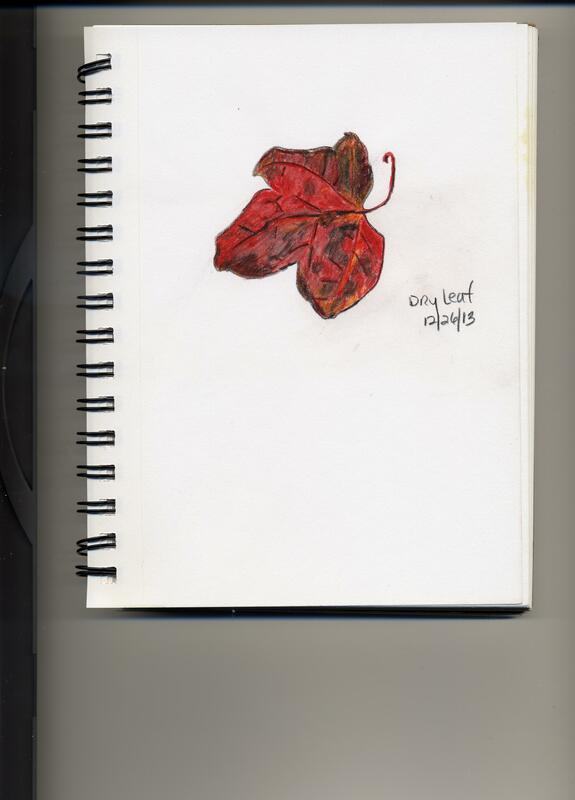 On the twenty-sixth, I was tired again from shopping, so I drew another leaf from my maple tree. Today I chose a potted plant that lives in my dining room. I’m pretty good at leaves but I’m not good at pots. Maybe I just need some more practice. Or some more pencils. Santa let me down, but I’ll still be watching those clearance sales. This entry was posted in Uncategorized and tagged Christmas, Doctor Who, sketching, watercolor pencils on December 27, 2013 by releaf1954. Good for you, drawing every day. I’m still writing every day, even if it’s only 300 words. By the way, the Crayola bear is my favorite. Good for you, writing every day. I love that little bear, because it reminds me of the year my mom and I went to lots of Burger Kings trying to find them. She saved this one with her Christmas things and that’s where I found it after she died. I love remembering that fun quest we shared. The capitalization is understandable with that particular jar. I love it, too.